Listen to your parents – and record their stories! It’s amazing what you may find once you start digging! Put it all together, then start sorting… You can do it! Earlier this year, I pounced on an online discount on DNA analysis for ethnic origin by Ancestry – one of the most widely known companies who do ancestry searches. I received a kit in the mail, spit a few times in a little bottle, sealed it and sent it off to Ireland. It took at least two months, but I was rewarded with the revelation that I am 99% Lithuanian and 1% Finnish-Northwestern Russian. How fascinating to know! The test also enabled me to register on the Ancestry site with parents surnames and other details. On the anecdotal side – my sister was crushed… We knew that our mother’s grandmother had a Polish surname, and we delusionally harboured secret aspirations to a shred of Polish nobility – as opposed to our actual flaxen agricultural roots… Alas we could not lay claim to a forgotten castle in the Carpathians. The very day after registering, I was excited to be contacted through the Ancestry site by a person living in Pennsylvania wondering if I might be a third cousin on my mother’s side. He mentioned several familiar names including my mother’s younger brother, whom we knew well. He had emigrated from a DP camp in Germany, being sponsored by their uncle in Wilkes-Barre, Pennsylvania, and later made his way to New Jersey, where he lived with his wife Birute and had a son, Remigijus John, with whom we are all still in contact. The discovery of more possible cousins on my mother’s side in North America was a complete surprise. Though we knew of my Dad’s family, our mother’s relatives were always more of a mystery. Or was it? Perhaps we were just too preoccupied to ask Mom for details about her family tree, or to listen attentively when she talked about them, and while she still remembered. That may be the most important stepping stone in this journey of discovery. About 40 years ago, I did come across another set of cousins living in Argentina. One of them, Estela, found us in Toronto during a Lithuanian Song and Sports Festival she participated in. We’ve kept in touch, met one of her brothers, and are going to see her in Buenos Aires when we travel there next year. Apparently our fathers were cousins. 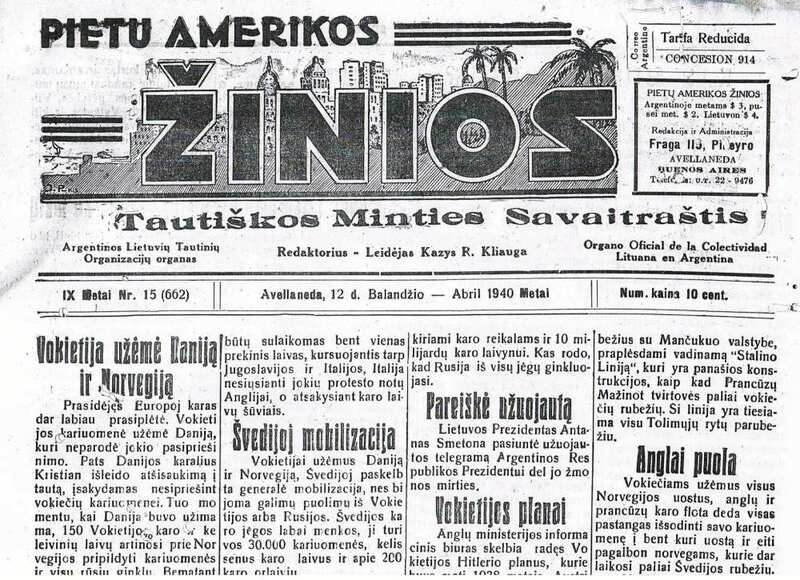 An interesting coincidence for me, as a retired editor of Canada’s Lithuanian weekly Tėviškės žiburiai, was that Estela’s father, Kazimieras Kliauga, was the editor of a newspaper called Pietų Amerikos žinios back in the 1940’s. The regime of the time was not tolerant of the ethnic right-wing press, and the family suffered certain repercussions. Luckily, a short time after I met them, I asked for their family tree. Now I just need a magnifying glass to decipher it, and begin fitting everyone together. Ancestry.com or .ca is just one of the firms that analyze DNA – and it costs more the deeper you delve. There are also sites that will analyze your DNA for genetic health issues. The most common, besides Ancestry – are My Heritage, 23andme, and NextGenDNA. Discounts can sometimes be found on Groupon or other discount sites.